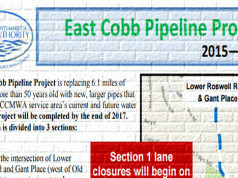 According to Cobb County-Marietta Water Authority staff, the contractor for the East Cobb Pipeline Project encountered an unexpected conflict under the ground in the original start point. Fixing it now would create a significant delay in the start date. 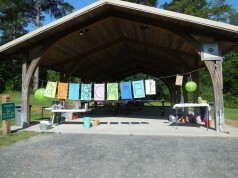 Instead, crews are going to shift the start point to just south of Terrell Mill Park. 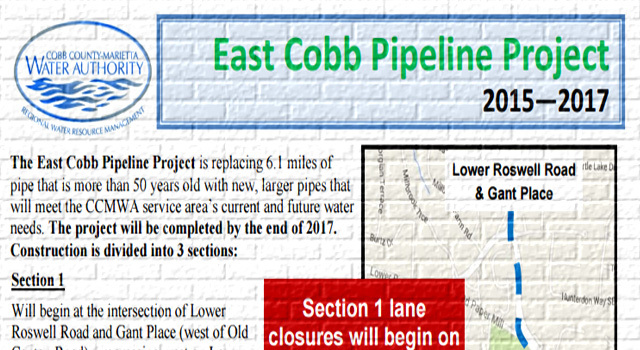 The exact location will be announced and preparations will start as soon as plans are finalized and coordinated with Cobb County Department of Transportation and others. 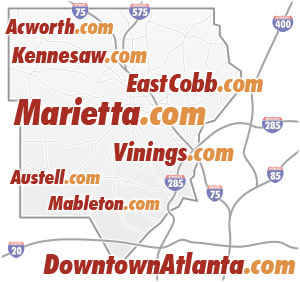 The tentative start date for lane closures is now Saturday, Sept. 19, 2015. CCMWA staff will provide confirmed start times and locations for the lane closures as soon as possible so drivers know what to expect. 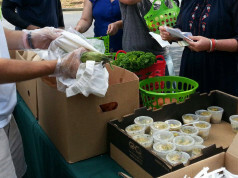 For more information, please call the project hotline at (770) 514-5301 or vist www.ccmwa.org.